For those of you who are following these prompts, the past few days have been full. Today I want to give you just a few thoughts to ponder, and respond in image or word as you feel moved to. 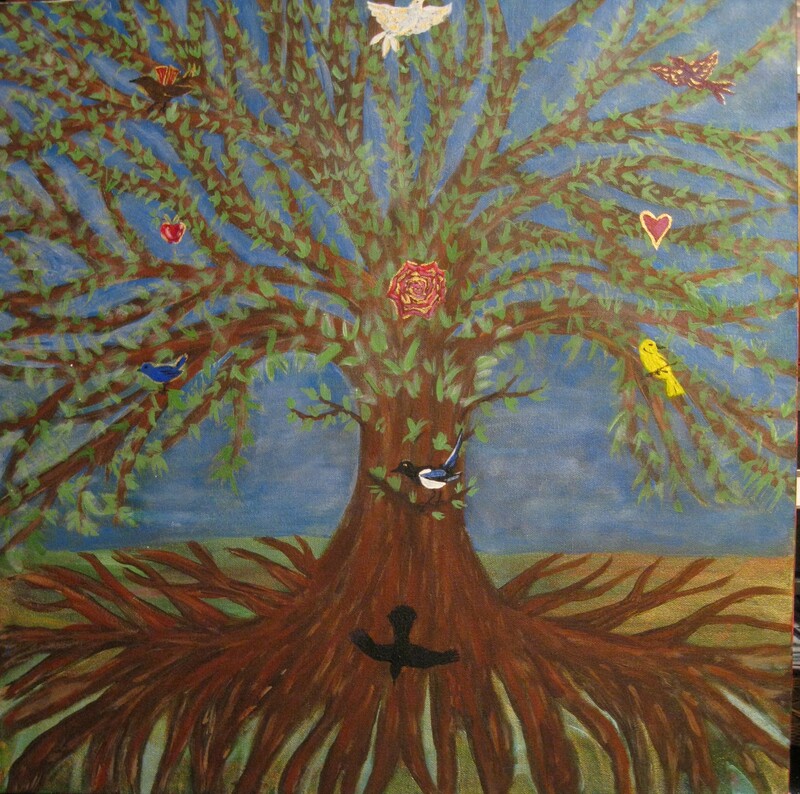 My work in progress above is titled “Heart of the Mater”, and it references the Kabbalist Tree of Life. Last night after taking this photo I glazed the whole painting with a mixtures of red paint the color of blood. Now I will brighten out the images again. Each of the 10 images in the tree are symbols that came to me in dreams or waking visioning, and have stories that go with each. When it’s complete I”ll post again. “Mater” is the Latin word for mother. “Mater” is also the root word of “matter”, “material”, and “matrix”. Also “maternal”, “matriculate”, and “matrimony”. Think about that. Whether you understand “mother” literally, as your birth mother, or figuratively, as “Mother Earth”, “Mother Mary”, “Divine Mother”, “Holy Mother”, or some other form of the Divine Feminine, “mater” truly is our matter, the material of our very being, and the matrix in which we live. What matters most to you in this life? How do you treat the material of this world, our water, our earth, our oil, our sunlight? How do you treat the material of your own body? For you, how do you get to the heart of the mater? Day 42 of a series of daily prompts for written, visual, or art journalling, or just for pondering. For more background information, see the Intro pagehttps://catcharissage.com/2014/10/29/announcing-sixty-days-of-visual-journalling-prompts/, or this post on visual journalling: https://catcharissage.com/2014/07/12/talking-about-journals/.